"Brick clamp" also refers to a device (usually powered) to lift quantities of bricks. 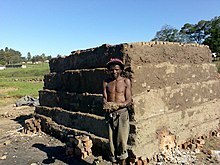 A brick clamp is a traditional method of baking bricks, done by stacking the unbaked bricks with fuel under or among them and then setting the fuel on fire. The clamp is considered a type of kiln. If the clamp is insulated by packing earth or mud around it, it becomes a scove kiln. ^ Sowden, A. M. The Maintenance of brick and stone masonry structures. London: E. & F. N. Spon, 1990. 18. Print. ^ Whitney, William Dwight. "Scove, 2" The Century dictionary; an encyclopedic lexicon of the English language, Vol. 7. New York: The Century Co., 188991. 5,415. Print.